Lewis Hamilton picks an MBGL or the road. 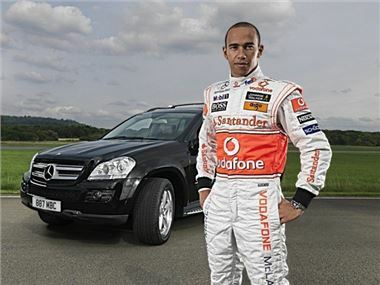 Vodafone McLaren Mercedes Formula 1™ driver Lewis Hamilton is about to get behind the wheel of another Mercedes-Benz GL-Class – his preferred car choice when away from the racetrack. His latest 4MATIC model – a new GL 320 CDI – is powered by a refined three-litre V6 common-rail diesel engine, developing 224hp at 3800 rpm, and 510Nm from 1600 rpm – 2800 rpm. Lewis’s Vodafone McLaren Mercedes Formula 1™ car, on the other hand, has a 2.4-litre V8 engine developing at least 500hp more, at an incredible 19,000 rpm. Explaining his choice of road-going vehicle, Lewis said: "At the track I always drive on the limit, but on public roads I like to relax, kick back and cruise. The GL’s perfect for that – it’s got plenty of space for all my kit, a brilliant sound system, and the high driving position gives me a clear view of the road ahead. It’s just about the most comfortable road car I’ve driven. "My GL looks great – metallic black paint with matching leather, privacy glass, and it’s got awesome 21" AMG wheels. But with standard air suspension, it still rides beautifully." The luxurious seven-seat GL-Class range has 4MATIC four-wheel drive with the 4ETS Electronic Traction System as standard, and all three engines (GL 320 CDI, GL 420 CDI, GL 500) drive through the 7G-TRONIC automatic transmission system. The standard Off-Road Pro package adds low range gearing, centre and rear differential locks, under-body protection, and extended ground clearance for the AIRMATIC suspension. All this makes the GL as fearless off the beaten track as it is peerless on-road. Inside, all seven occupants are cocooned by a huge amount of accident-prevention equipment. ESP® Electronic Stability Program is fitted to every new Mercedes-Benz, and the GL range also adds the PRE-SAFE® anticipatory occupant protection system. Six airbags, seat belt pre-tensioners with belt force limiters (for front and middle row outer seats), and Neck-Pro front head restraints all form part of the safety equipment on every GL. Like all GL-Class models, Lewis’s new car features the advanced COMAND navigation and audio system as standard. With radio, hard disk European mapping with TMC, integrated six-disc CD/DVD changer, music register and memory card slot, entertainment on the move is not a problem. Standard Bluetooth® connectivity allows mobile phones to connect to the car, allowing hands-free calls – and Linguatronic voice-operated software allows the driver and car to "talk" to each other. Every seat in the car is full-size, capable of taking an adult passenger – and the rear row folds electrically to increase luggage space to an impressive 2300 litres. The GL can tow up to 3500kg (braked; unbraked limit 750kg), and standard ESP® Trailer Stability Assist keeps things on the straight and narrow should the potentially dangerous "fishtailing" occur. Lewis concluded: "This is the second GL I’ve owned, and it’s a privilege to have a job where I get to drive such amazing cars all the time." The Mercedes-Benz GL-Class range starts from £53,615 and like every Mercedes-Benz passenger car, has a three-year unlimited mileage warranty, and MobiloLife anti-corrosion and breakdown cover for up to 30 years.